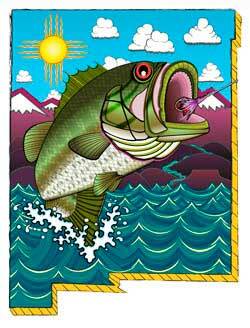 SANTA FE -- Gregory Lucero de Scargall's design of a largemouth bass jumping for a lure with a New Mexico background of blue sky, white clouds and a Zia-symbol sun was selected as the grand-prize winner of a contest to design the logo for the state's new bass fishing license plate. Dominic Reyna, 14, of Clovis, and David Walrod, 13, of Clovis, were winners in the youth division for artists ages 17 and younger. They will receive $50 prizes. Taylor Mirabal, 10, of Grants, received an honorable mention.